The authors and contributors of Ambient Assisted Living have recognized that the demographic profile is changing in many developing countries and have factored in an inversion of the demographic pyramid. The technology of ambient assisted living (AAL), supports the elderly and disabled in their daily routines to allow for safe and independent living for as long as possible. Dedicated to ambient intelligence—electronic environments that are sensitive and responsive to the presence of people—Ambient Assisted Living highlights the technologies that center on the needs of these special interest groups, such as the elderly or people with disabilities. 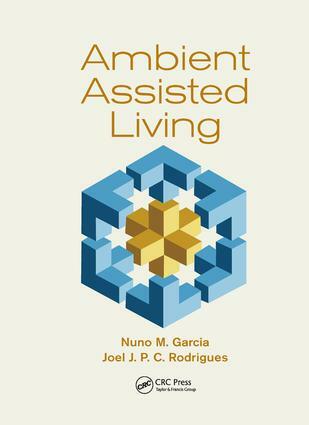 Beneficial to students, practitioners, and users of ambient assisted living (AAL), this text compiles scattered information on the subject, outlines the most important and significant work in related literature, and covers the latest hardware and software for ergonomic design pertaining to AAL. From inception to implementation, the text assesses what has been produced and researched so far and looks for trends and clues for the future. It reviews literature on AAL published since 2007 and describes the main features and areas of products or systems that interlink and improve new or existing technologies and systems. Ambient Assisted Living highlights technologies that adapt to the user rather than the user adapting to the technology. This text proposes technologies that can enable assisted persons to live independently for longer and reduce the need for long-term care. "One of the most informative books, that includes almost all recent advances and technologies as well as aspects of AAL, in smart environments of today. The book, drives the readers’ minds for more scientific inspirations in the era of Peta, within AAL context." "the book seeks to show AAL technologies from its inception to implementation. It can help to disseminate them. The book will be an important way to communicate important AAL concepts. This book is an important contribution in the field of AAL. The contents and structure are adequate for its publication." "The main strengths of the book are that it covers the latest development of AAL and the comprehensive review on AAL including the concept, application, software, system, services, and many others. The text is easy for the readers to follow. It is valuable material for students, developers and researchers that are interested in working on AAL to gain a good overview and insights, thereby to quickly identify the opportunities where they can make novel contributions." Nuno M. Garcia holds a PhD in computer science engineering from the University of Beira Interior (UBI, Covilhã, Portugal) (2008). He is assistant professor at UBI and invited associate professor at the Universidade Lusófona de Humanidades e Tecnologias (Lisbon, Portugal). He was founder and is coordinator of the Assisted Living Computing and Telecommunications Laboratory (ALLab), a research group within the Instituto de Telecomunicações at UBI. He was also co-founder and is coordinator of the BSAFE LAB – Law enforcement, Justice and Public Safety Research and Technology Transfer Laboratory, a multidisciplinary research laboratory in UBI. He is the coordinator of the Cisco Academy at UBI and head of EyeSeeLab in EyeSee Lda. (Lisbon, Portugal). He is also chair of the COST Action IC1303 AAPELE – Architectures, Algorithms and Platforms for Enhanced Living Environments. Joel J.P.C. Rodrigues is a professor in the Department of Informatics of the University of Beira Interior, Covilhã, Portugal, and senior researcher at the Instituto de Telecomunicações, Portugal. He received the habilitation in computer science and engineering from the University of Haute Alsace, France; a PhD in informatics engineering; an MSc from the University of Beira Interior; and a five-year BSc (licentiate) in informatics engineering from the University of Coimbra, Portugal. His main research interests include sensor networks, e-health, e-learning, vehicular delay-tolerant networks, and mobile and ubiquitous computing. He is the editor-in-chief of the International Journal on E-Health and Medical Communications, the editor-in-chief of the Recent Advances on Communications and Networking Technology, the editor-in-chief of the Journal of Multimedia Information Systems, and editorial board member of several journals.